The camp connects people and movements. The 2018 Climate Camp took place from 11th till 22nd of August. 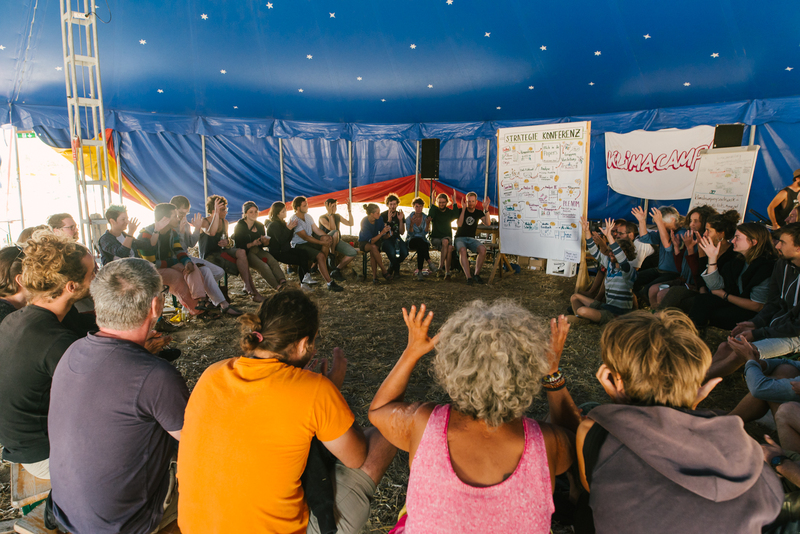 We built up the camp together, had networking, education, arts and actions… and we tried out tomorrow’s society – social, ecological and based on grassroots democracy. 2018’s camp was smaller and less action-orientated than 2017’s. In our debates we focussed on the future of the Rhenish lignite region and on reflecting the practices, structures and strategies of the climate justice movement. And at the end we took the camp down together, too. You can get a good idea of the camp by checking out our photos. There’s also more information on the German site. …live alternatives together: anti-authoritarian self-organisation, our own energy supply, compost toilets, music and much more! …create networks. At the camp it’s not only people who meet, but also movements. …educate ourselves. There are courses, workshops, open space, panel discussions, spaces and events for children and teenagers, and a cultural programme. We deal with a diverse range of topics, from theoretical analysis of climate change to practical stuff like building a windmill. …develop actions. There have always been actions protesting against coal over the last few years at the Climate Camp. In 2015 Ende Gelände took place here, 2016 the action lab was our guest and in 2017 there were many different actions as part of the Action Days in the Rhineland. Every year since 2010 a Climate Camp has taken place in the Rhenish lignite mining area. This coal field is the biggest emitter of carbon dioxide in all of Europe. Still people are forced to resettle and villages and landscapes are destroyed, all for coal mining. In addition to the Climate Camps, the Hambach Forest has been occupied since 2012. In 2015, the action “Ende Gelaende“ was a peak of the climate movement: more than a thousand people occupied a coal mine for one day. With more than 3000 participants, the 2017 camp was the biggest to date in the Rhineland. At the same time the connections to the neighbours aswell as the coal workers were deepened. This can hopefully contribute to kicking off a wide debate on the future of the region.